FRANCE defeated Croatia 4-2 in a World Cup final for the ages in Moscow. 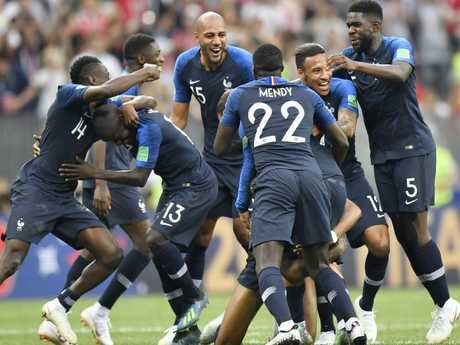 Les Bleus were one of the hot favourites heading to Russia and they justified the hype with a stunning performance in a match full of talking points. It’s party time in France. WE won't soon forget the 2018 World Cup final - and neither will the history books. The tournament that gave us VAR controversies and diving scandals delivered all that and more in a crazy decider that ended in ecstasy for France and heartbreak for Croatia. Les Bleus were outplayed for much of the match but showed a ruthless killer instinct their opponents lacked to win the final 4-2. This decider saw as many goals as the previous four World Cup finals combined, while today was the first time since Brazil beat Sweden 5-2 in 1958 that more than five goals were scored in a final. It was madness galore in Moscow because of the actions - good and bad - of the players and also some spectators. SBS football analyst Craig Foster put it perfectly when he said it was "one of the great World Cup finals". Croatia started stronger, constantly finding acres of space down the left flank. Ivan Perisic did most of the early running but his crosses didn't find the mark. Despite that dominance France was first to find the back of the net. Croatia complained when Antoine Griezmann was awarded a free kick just outside the area but its pleas fell on deaf ears and the striker made the most of his good fortune. He whipped in a dangerous ball and Mario Mandzukic leapt up to try and head it away, but the ball grazed his head and ended up as an own goal - the first ever own goal in a World Cup final. "It's a cruel blow for Croatia," SBS commentator Martin Tyler said. But it didn't take long for Croatia to get its revenge. After his early probing runs, Perisic finally found some joy when the ball bobbled to him on the edge of the box after a free kick was lobbed into the area. He took a touch then lasered a bullet into the bottom corner to make it 1-1 after 28 minutes. As it has done at various stages of the tournament, VAR then came into play - and it haunted Croatia as Perisic went from hero to villain. 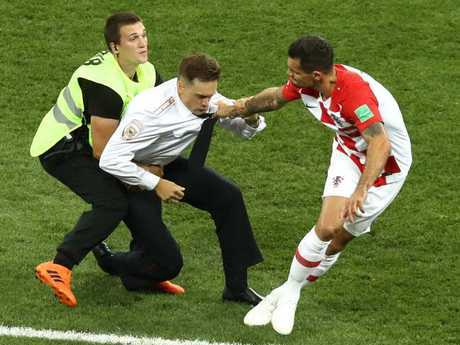 Play was stopped for several minutes while the referee checked replays of a cross into France's box to see if the ball struck a Croatian player's hand. After lengthy looks at various angles the whistleblower was in no doubt that the ball hit Perisic's arm and he pointed to the spot. Griezmann made no mistake and it was 2-1. Foster couldn't understand how France was ahead at halftime given Croatia was by far the better side in the first 45 minutes. "How France are leading this game 2-1, I actually have no idea because it has been Croatia who have been the more positive, been the more creative, been the more attacking and been the more aggressive and who turned up from the first moment of the game," Foster said at the break. "France have got to be thinking, 'How are we leading this game?' Every time the ball came in the air France looked so vulnerable, it was incredible. "They have been fearful when the ball has been in the air, it is amazing." Just like it did in the first half, Croatia started the second stanza the more dangerous side. Ivan Rakitic slipped a lovely pass behind the defence into the path of Ante Rebic, whose left-footed strike forced goalkeeper Hugo Lloris into a desperate jump as he tipped the ball over the crossbar. Kylian Mbappe threatened to score on a counterattack as he did well to stay on his feet inside the box when under pressure from Domagoj Vida, but his shot hit the keeper. The game then had to be stopped because of a pitch invasion. At least three people were chased by security and dragged off the pitch five minutes into the half. You’re not on my team. The break didn't distract France from the task at hand as Paul Pogba started - then finished - a slick move. He drilled a perfect long pass from inside his own half to Mbappe on the right flank, who surged ahead and crossed into the box. Griezmann had the ball at his feet with his back to goal but didn't rush anything, laying a pass off to Pogba - who had made plenty of ground to reach the edge of the box. His first shot was blocked but he kept his composure to slot a side-footed effort with his non-preferred left leg into the net. Paul Pogba sent his teammates wild. The nightmare got worse for Croatia as Mbappe made it 4-1 with 25 minutes still to play. Lucas Hernandez drove forward then squared a pass up to his teenage teammate at the top of the area. The 19-year-old Mbappe then rocketed home a shot into the bottom corner for his fourth goal of the tournament. 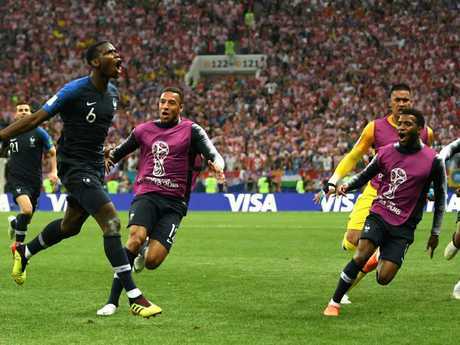 Just when you thought France was going to run away with it Lloris was responsible for what Martin Tyler called an "absolute catastrophe" and "moment of madness" in the 69th minute. A simple back-pass found its way to the shot-stopper and he trapped it, then looked to change his mind at the last second about what he wanted to do. Rather than clear the ball, he tried to poke it with the outside of his left foot only for the ball to hit Mandzukic's boot and rebound past him for a 4-2 scoreline. 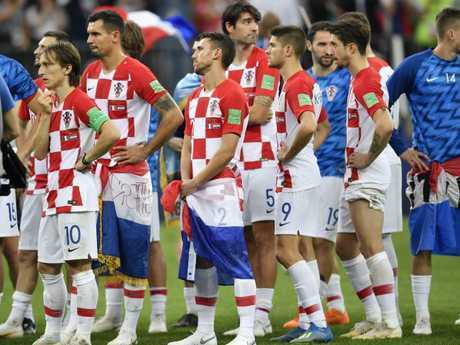 Croatia fought gamely to the end but the never-say-die attitude that saw it win its past three knockout games after they'd gone to extra time couldn't save it now. No matter what coach Zlatko Dalic's troops threw at Les Bleus no miracle was forthcoming. At the sound of the full-time whistle the Croatians sunk to the turf in despair while the French stars celebrated like it was 1998 - the last time they won a World Cup. That 20-year wait for another championship is worth it now. It was pure pain for Croatia.